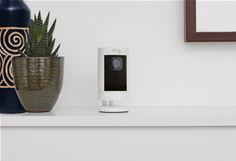 LAS VEGAS – Jan. 8, 2018 – Ring, the leader in home security, unveiled at CES 2018 its whole home security ecosystem, which includes several new security devices that bolster the Ring of Security around homes and neighbourhoods. Among the new products are two new indoor/outdoor security cameras and a line of smart, connected outdoor lights, called Ring Beams. Stop by the Ring booth (Sands, Halls A-D – 42525) at CES 2018 January 9-12 to learn more about Ring’s new security devices coming in 2018. Ring will host a press conference at 1 p.m. PT on January 10 at its booth with Ring spokesperson Shaquille O’Neal and Ring founder Jamie Siminoff to discuss all the new Ring products and features coming in 2018. In addition, Ring Spotlight Cam, a 2018 CES Innovations Awards Honoree, will be on display in the Innovation Showcase, Tech West, Venetian Ballroom E/F. Ring will also be exhibiting at Pepcom Digital Experience! at The Mirage on January 8 and Showstoppers at the Wynn Hotel on January 9. Ring’s mission is to reduce crime in neighbourhoods by creating a Ring of Security around homes and communities with its suite of home security products. The Ring product line enables Ring to offer affordable, complete home and neighbourhood security in a way no other company has before. In fact, one Los Angeles neighbourhood saw a 55 percent decrease in home break-ins after Ring Doorbells were installed on just ten percent of homes. For more information, visit www.ring.com. With Ring, you’re always home.